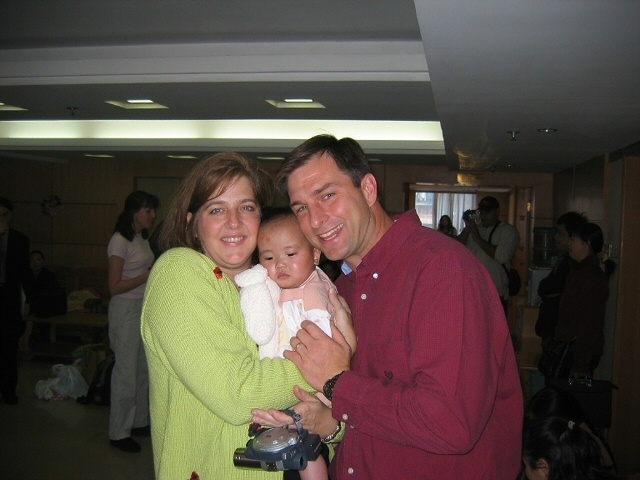 Now to Him who is able to do IMMEASURABLY MORE...: November 22, 2004 - Kate's Gotcha Day! I was actually able to sleep until about 5:30 or 6 this morning. I laid in bed and soaked up the moment- almost exactly the way I had the morning that I was in labor with Sarah- knowing that the events of today would change my life forever. Doug finally woke up and interrupted my thoughts. We talked until the sun came up. We'd waited so long for this day. It was finally here and yet it still seemed like an impossible dream that should be happening to someone else. 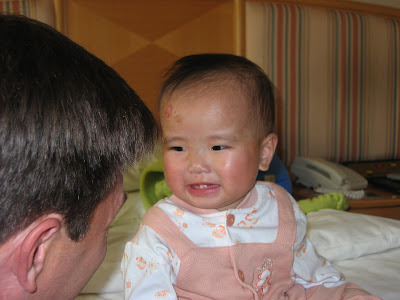 I had spent hour upon hour over the last few months reading adoption stories on the internet. It felt a bit strange to now suddenly be the main character in the unfolding, life-changing drama that today was sure to hold. My stomach felt as if a million butterflies have taken up residence there... the thought of eating breakfast made me nauseas. Just before leaving our hotel room for the bus, Doug and I knelt beside our bed and prayed for this special day. Doug, of course, did most of the praying, as I sobbed uncontrollably. I could not help but look back and remember when the dream to adopt from China was born in my heart almost 30 years ago. Now I was less than an hour away from the realization of that lifelong dream. I marvel at the beautiful way God weaves the events of our lives, creating something that we could not have envisioned in our wildest imagination. We see small glimpses of His hand at different times in our lives, but days like today seemed almost like an unveiling of a lifetime of His work in my heart! Doug and I were the first off the bus at the Civil Affairs Office and up the elevator to the third floor. When we got off the elevator there were families and babies everywhere. My eyes wildly searched every little face to see if I could find our Kate. None of them looked like her, but the picture we had was already 7 months old, so I wondered if maybe she had just changed so much that I didn't recognize her. 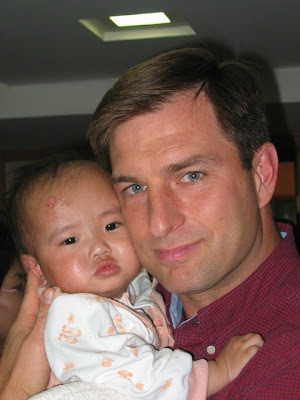 Within only a few moments, the workers from Kate's orphanage filed into the room, each holding one of our girls. I scanned back and forth, trying to figure out which was Kate. But before I knew what was happening, our names were being called! My heart nearly jumped from my chest and the butterflies in my stomach all fluttered in unison. We practically ran to the middle of the room. 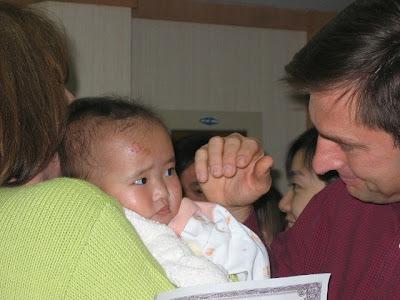 A young woman from the Civil Affairs Office was now holding Kate, ready to hand her to me as soon as we proved to be her new parents. I felt numb seeing Kate in real life for the first time! I leaned down, took her hand, and tried to talk softly to her so that she wouldn't be afraid. The lady did not have much patience for this and simply said... "This is your daughter! You may take her!" She thrust her into my arms and the transaction of a lifetime was complete! I could not see Kate's face at that moment, as she had her cheek pressed against my chest. I remember distinctly, though, the feeling of having her precious little head under my chin. I kissed the top of her head and felt the wonderful warmth of her body against mine. She was so tiny...so beautiful...so vulnerable and afraid... and mine!!! I wanted to freeze time at that very moment!!! 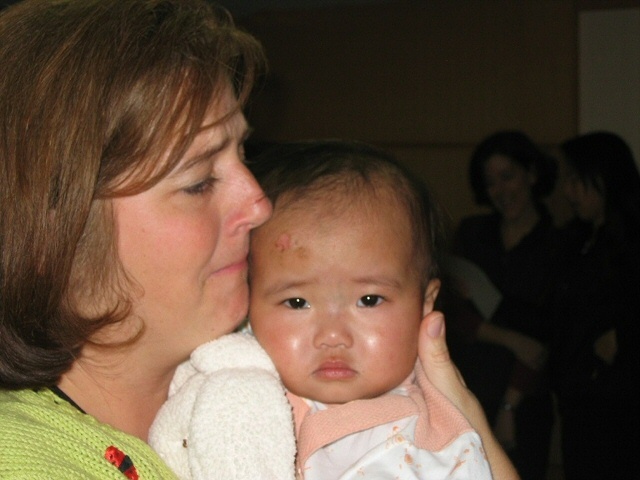 I could not hold back the tears as the reality of it all hit me ~ All of my dreams...born in the middle of a Civil Affairs Office in China! This delivery room had not been as much unlike the delivery rooms of my other three children as I had expected. Our fourth child was delivered to us in this most unusual way, and yet she is as much ours as Russ, Sarah, or Ryan. I feel an intensity of love for her that words cannot describe. All of my fears and questions melted away in an instant... God's weaving hand was more evident then ever before in my life and I had never felt happier than I did at that moment! 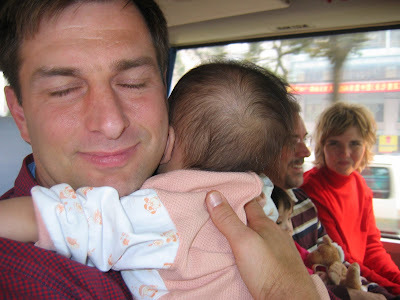 Less than an hour after arriving, we were walking out the doors and loading back onto our bus with our new daughters. Nine new families formed in less than an hour's time... What an odd, yet wonderful way to watch the birth of a family. I will never forget the way I felt holding Kate on that bus. I stared at her, I kissed her, I whispered "I love you" in her ear, I decided that she was one of the most precious babies I'd ever laid eyes on... Nothing mattered at that moment, except that I was her mother! We would return to the Civil Affairs Office this afternoon. The bus ride could not have been more different than the one this morning. Everything had changed and now we had only to make it "final". It was already final in my heart though! 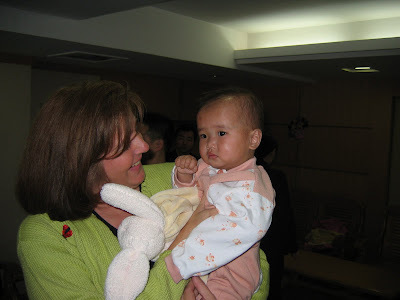 I was anxious to have the Chinese government officially agree with what I already knew~ She was our daughter! What God had ordained...man made official! A forever family was born! The princess in her red "slippers"!